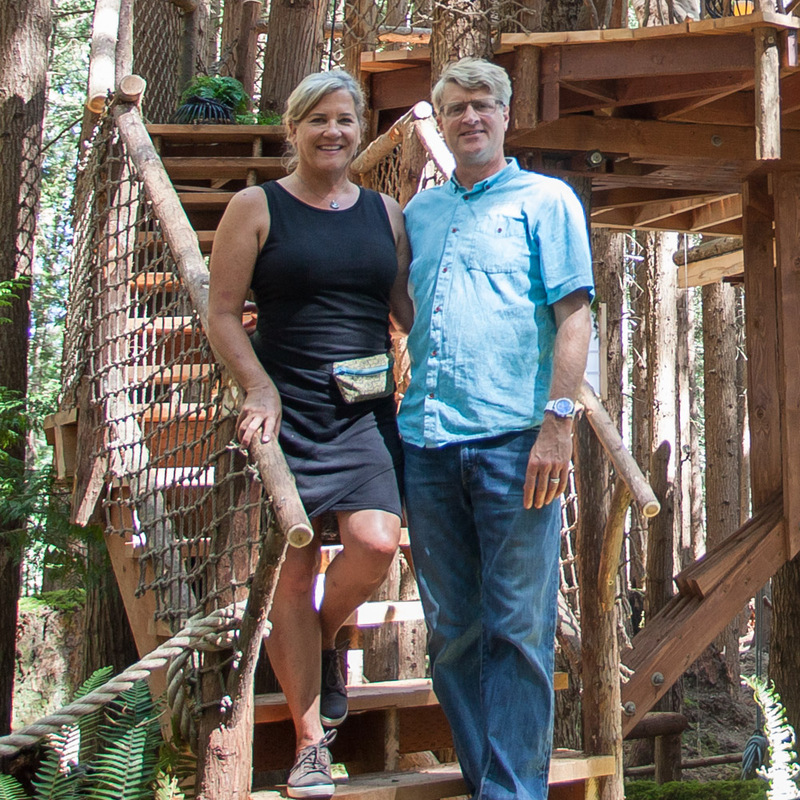 Photo tours of Pete Nelson's treehouses from Season 6 of Treehouse Masters on Animal Planet. With a lodge as cozy as this treehouse, skiers might skip the slopes and stay in all day! Nestled 20 feet high in a Douglas fir and two red cedars, this ski lodge-themed treehouse boasts a timber frame, dual-sided fireplace, and hidden door to the master bedroom. The bunk loft and gaming space make this ski chalet treehouse a haven for kids, while mom and dad can enjoy a little après ski on the 200-square-foot deck. Skis and trees are a match made in heaven! The Douglas fir tree that helps host this treehouse is over 300 years old. What a beauty! A series of sturdy staircases lead the way to the treehouse. Can you spot the ski lift chair hanging from a beam underneath the treehouse? A composting toilet lies inside the outhouse on the way to the deck. The wraparound deck provides ample space for skiers to soak in the views of the surrounding forest. To the right, you can see the exterior half of the dual-sided fireplace. It keeps folks warm as they enjoy an après ski treat outside. Our prefabrication crew crafted this gorgeous timber frame above the fireplace—it nods to the classic ski lodge aesthetic. After skiing the slopes all day, this family can cuddle up in front of the fireplace in the living room of the treehouse. Large windows frame great views of the magnificent Douglas fir host tree. The exposed rafters create the feel of an authentic ski lodge. The comfy and secluded master bedroom is hidden behind a secret door. With all those windows, there's no way guests could forget that they're dreaming high up in the trees! A wet bar (complete with a wine fridge) is tucked behind the ship’s ladder leading to the kids' loft. Our clients' kids loved seeing their bunkbed loft for the first time—who wouldn't love snoozing in this cozy nook?! And check out those custom stairs leading to the top bunk. Each stair doubles as a drawer. The loft also includes a reading and game corner. High ceilings, wood paneling, and the dual-sided fireplace make this treehouse feel like a bonafide ski lodge. We had the best time building this ski lodge treehouse and wish the owners many good times up in the trees! For another look at the treehouse, check out Animal Planet's behind-the-build video, below. Thank you for taking a look at our ski lodge treehouse! You can learn more about our design + build process, here. And stay up-to-date with our current builds by following us on Facebook and Instagram.